-The rails are made the highest grade Scandinavian Birch ply laminated to a 44mm width. This gives the bed amazing strength and beautiful top edge detail. 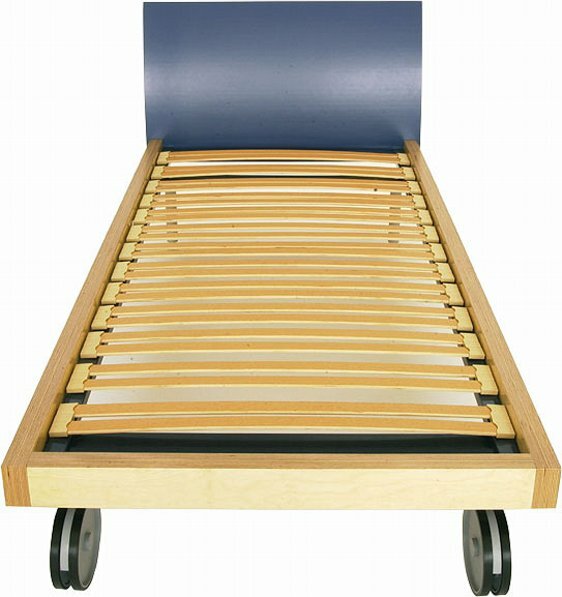 -It has the same slat base and tie bar system, which is employed in all our double beds. -Headboard shown is faced in linoleum, which a warm natural material and is available in fun colours such as red, blue, green and purple. The headboard is also available in veneers. -The frame and headboard are painted in clear polyurethane lacquer. The bed as shown is priced at £575.00. This does not include a mattress. We have a cheaper options for single beds so please talk to us 020 7231 1062. The Ply Bed can also be made as a double.